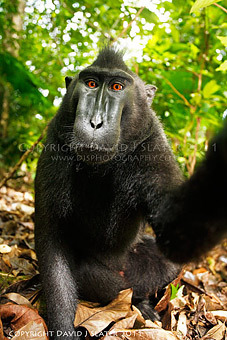 Considering the worldwide press coverage of the last few weeks, it is difficult not to have heard about the monkey selfie case opposing wildlife British photographer David J. Slater (1) to Wikipedia’s Wikimedia web site about who shall be the owner of the copyright over the monkey selfies taken while Slater was on Sulawesi Island in Indonesia. 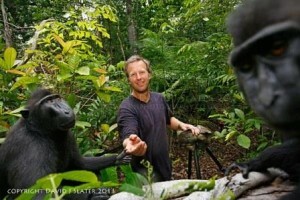 After following and shadowing a group of Crested black macaque for several days, Slater succeeded to get close to them and to interact with them until they eventually grabbed his camera and took the below-reproduced very surprising pictures (2). And Slater himself was not forgotten. Wikipedia decided to publish the pictures as being in the public domain, claiming there could not be copyright over the pictures since they were taken by animals. And that is when trouble started for Slater since the images on Wikimedia can be copied and used freely. He even thinks about filing a judicial complaint against Wikipedia for copyright infringement. The controversy is not without a legal issue. According to International copyright law, English law, U.S. law or French law, copyright can only be vested in human authors. That is why Wikipedia considers there cannot be copyright over the images. On the other side, Slater argues that he is the legal owner of the copyright since the pictures were taken with his camera and because he had himself decided of all the technical settings in accordance with his artistic view (3). 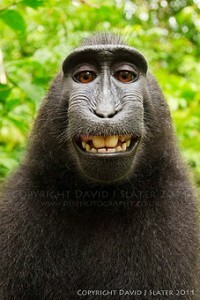 However he himself admits that he did not stage it all since he was surprised when the monkeys grabbed his camera. Would such elements be enough for a judge to issue a ruling in Slater’s favor? Not so sure, especially according to copyright law in Common law countries. But one thing is certain: on an artistic level, one should be thankful to Slater for bringing back these astonishing pictures from Indonesia. Whatever the legal issue in this case (if any), without Slater, there would be no pictures at all (4). (1) David J. Slater’s web site: http://www.djsphotography.co.uk/. (2) Photographs are being reproduced, for information purposes only as part as fair use, as they are published on David J. Slater’s web site. If you want to know more about his adventure, you can read his own original story here: http://www.djsphotography.co.uk/original_story.html. (3) The camera was put on a tripod. 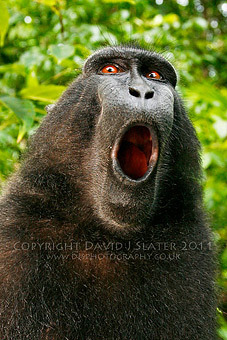 (4) Through a recent press release, Slater announced he was giving away canvas prints of his now famous monkey selfie for free to help fund the Sulawesi crested black macaques Conservation Programme. Share the post "When monkeys take their own selfies"